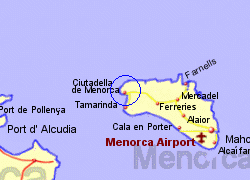 Ciutadella de Menorca, to use its full name, is a town situated on a natural inlet on the western coast of the island of Menorca. The town has a considerable and sometimes violent history (after being under moorish rule, the town was overwhelmed by a Turkish invasion in 1558, which resulted in the surviving inhabitants being sold as slaves in Istanbul). It is now a tranquil place which attracts many tourists, party by the attractive surroundings and partly by the Italian styled architecture which was popular with those building houses here in the 17th century. 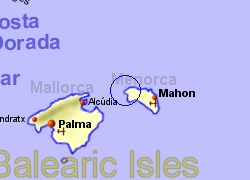 Being a natural inlet, it is also a port, used today by fishing and liesure vessels, plus ferries to Barcelona and Mallorca. 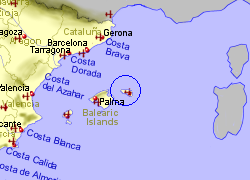 Map of the Ciutadella area. Situated in the North-West of Menorca in a tranquil countryside location yet only a short drive from the town of Ciutadella lies Villa Magranas. If you are looking for a quiet and peaceful villa holiday to Menorca then this villa is the ideal choice! This 3 bedroom apartment with swimming pool is located in Cap d'Artrutx and sleeps 6 people. It has WiFi and air conditioning. The apartment is near golf and beach.